This article suggests that Google Earth can be used to make decisions about wind farm sites, by using 3D models to visualize the effects of decisions. The first part looks at a recently proposed site in Devon. The site is an elevated location close to the A361 North Devon Link road. The Ordnance Survey map extract is centred on the proposed site. I have prepared a Google Earth file comprising an Ordnance Survey map extract, photographs and 3D scale models of the proposed wind turbines. 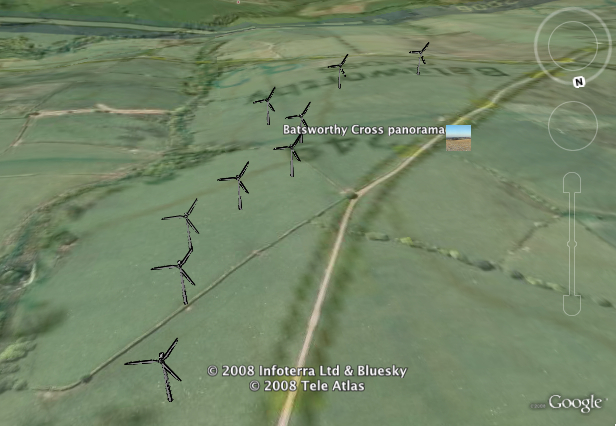 • Open the Batsworthy Cross folder after loading the Google Earth file and examine the site. • The dimensions of the site, and the distance to the nearest dwellings can be calculated using the measuring tools in Google Earth. • Get a better feel for the topography on the Terrain layer and exaggerating the height in Google Earth / Preferences / Elevation Exaggeration and changing the default setting from 1 to 2. Is the site likely to receive enough wind? • The opacity of the Ordnance Survey map can be altered after selecting it and adjusting the slider widget. 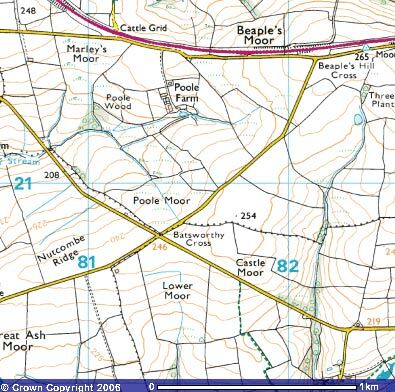 Students could suggest a suitable grid reference for a visitor centre. How accessible is the location? 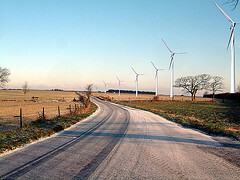 Would drivers on the A361 be distracted by the turbines? • Click on the photographs for a larger copy of the image. The photographs should help students to be able to visualize the scenery. Should this view be compromised with the introduction of wind turbines? • Consider getting in touch with pro and anti campaigners using the links below. Flickr photoset. Note that you can fly directly to the location if you already have Google Earth installed. Click the Fly To link under the pictures. You will need to download the Google Earth file before you see the 3D models and the OS map. Part two of this article suggests a learning activity based on Google Earth, incorporating several ideas from this page.